Okay. 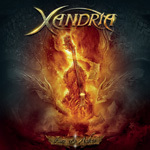 So Xandria it seems to be hanging on to their most recent vocalist, Dianne van Giersbergen, for this new EP Fire & Ashes. If you're counting, they've been through six singers in six albums. Now what's up with the EP? Maybe just keeping the band and the new vocalist present for fans? Not a bad idea. It's a mixture of three things. There's three new songs: Voyage of the Fallen, Unembraced, In Remembrance. They offer tried and true Xandria, delivering their usual epic symphonic power with operatic female vocals. No surprise there. In Remembrance is a ballad, and finds van Giersbergen at her operatic best. Which means you can't understand her without the lyric sheet. Another no surprise. They cover two fan favorites: Ravenheart and Now & Forever from Ravenheart, 2004 and India, 2005, respectively. The plain purpose here is obvious. It's to have Ms. Giersbergen record classic Xandria songs for fan consumption. I didn't go back to listen to the originals so, if you're that fan, you'll have to decide if they're better than the former. They sure sound like Xandria, but I just said that earlier. Finally, they do two covers, from Sonata Arctica, Don't Say A Word and from Meatloaf, I'd Do Anything For Love (But I Won't Do That). Not impressed with either of them. They made the former simply more symphonic and operatic. Then they torched the other. Like the EP's name, they set the song on fire and burned it to ashes. If it were me, I'd simply listen to the originals. Bottom line: I think this EP is for the fans and if you're that fan you'll like it. But if you don't blow your dollars, pounds, or euros to purchase it, you won't be missing much. Bottom line, this typical Xandria delivering their usual epic symphonic power with operatic female vocals. I think this EP is for the fans and if you're that fan you'll like it. But if you don't blow your euros to purchase it, you won't be missing much.